Looking for that depth and complexity of flavor for your chai but not exactly sure which spice delivers? Look no further than star anise. This little fruit offers a liquorice-like bouquet that builds nicely into the complexity of the chai spice mix. Like most of the spices in this masala chai, star anise has considerable health benefits. Be aware that Chinese star anise is considered safe for consumption and provides many health benefits. The Japanese star anise, however, is toxic when ingested and should never be consumed. Also be aware that you can't tell the difference between the two dried spices. Read your package carefully before adding to your tea. 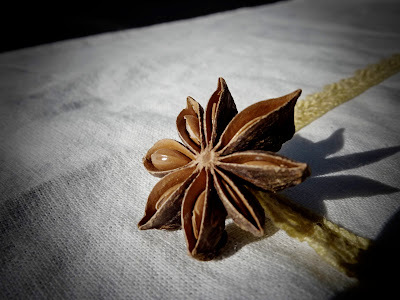 On a different and slightly less alarming note, an alternative to star anise—should you not be able to locate it at your local grocer, or you've been turned off by the warning stated above, or you simply find it too darn pretty to put into your tea to be discarded only a short time later—is fennel. It offers a similar flavor and depth and is a fine substitution for star anise in masala chai. My chai without one or the other of these ingredients always leaves something to be desired. Don't be left desiring. Add the darling star anise or the budget friendly fennel. You'll be glad you did. Something about tonight's Superbowl Halftime show made me flash back to the cover art from this remarkable '90s hip-hop group. Cue the Lite Brite costumes on the Black Eyed Peas backup dancers, perhaps one of the more interesting parts of the show.